Conveniently located in Harding University's American Heritage Conference Center, the Heritage Inn is an on-campus hotel with a Christian environment for tourist, conference and University guests. Whether you are a tourist to the White County area or a business person attending a professional seminar, you will enjoy the quality accommodations of the Heritage Inn. Conference guests are just steps away from auditoriums, executive conference rooms and banquet rooms. Visiting parents are within a short walk of their student's residence halls and classrooms, and all guests will find themselves centrally located in both Searcy and White County. 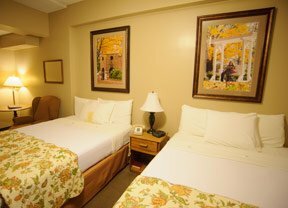 Tastefully furnished in traditional decor, the suites and rooms of the Heritage Inn provide a friendly, comfortable, convenient and affordable hotel for guests of Harding University, Searcy or White County. I would like to invite you to spend an evening at the Heritage Inn during your next visit to the White County area. Please call us at 501-279-4700 if we can be of any assistance. Our staff is ready to serve you.